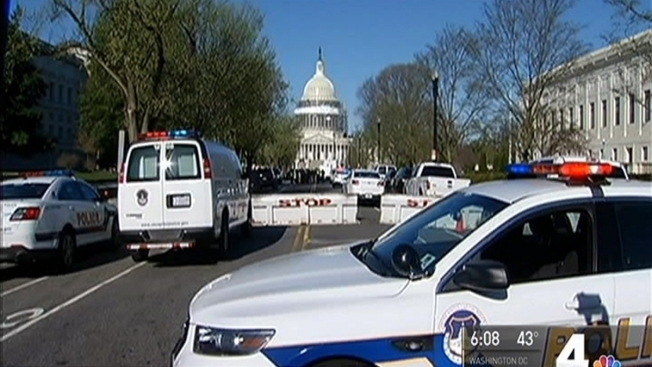 U.S. Capitol officials are planning a series of security upgrades outside the Capitol Complex, including installation of an underground alarm system, reinforced windows and K-9 units outside building entrances. The security upgrades, confirmed by multiple officials to the News4 I-Team, are being made to better prevent potential threats from entering buildings on the complex. The U.S. House Sergeant at Arms announced some of the enhancements during testimony in front of the U.S. House Committee on Administration. Records released by the committee detail the nature of the changes. The upgrades are being planned in the wake of a series of high-profile threats on the complex, including a visitor brandishing a firearm at the U.S. Capitol Visitors Center and a protester crashing a gyrocopter on the west front lawn of the Capitol. Capitol administrators plan to install “new, reinforced windows” to upgrade and strengthen the exterior faces of the U.S. House office buildings, including the Longworth, Rayburn and Cannon buildings, which all face the south side of the Capitol, the records said. An underground alarm system, which one congressional staffer compared to an “invisible fence,” would be built inches below the ground on the outside perimeter of the Capitol Building. The fencing, which would be installed by technicians with the Architect of the Capitol, would help detect threats after hours at the complex and help prevent trespassers from entering restricted spaces. According to committee records, U.S. Capitol Police plan to add highly specialized K-9 teams near building entrances “to patrol exterior zones to prescreen visitors and enhance our presence.” The officers would be deployed “to tactically address security concerns at key exterior points of entry in order to identify and mitigate threats before they reach the interior security screening checkpoints,” according to the records. Security enhancements on Capitol Hill are a balancing act for administrators, because Capitol Hill is an open campus for visitors, tourists, student groups, staff and lobbyists. More than 15,000 people work for the U.S. Congress, according to researchers at Legistorm, a D.C.-based organization tracking congressional employment. Timing for the upgrades is unclear until Congress completes its appropriations process to fund the legislative branch for 2017-2018. Congressional appropriations committees are expected to deliberate and discuss the plans in late spring. A hearing to discuss congressional funding was canceled Wednesday.